How has the cartoonist drawn Billy Hughes? What features has he chosen to highlight? What other symbols are used? What do you think they mean? Billy Hughes is sitting in a chair labelled Prime Minister. He is drawn with royal symbols used for coronations of the British monarch. He is wearing a crown, holding an orb and has his feet on the Stone of Destiny which is used today for the coronation of British monarchs. The orb is also labelled with the word ‘Dictator’. What are the differences and similarities between a Monarch, a Dictator and a Prime Minister? Why has the cartoonist drawn Billy Hughes in all three of these roles? On the wall behind Billy Hughes is an umbrella. Hughes was an umbrella salesman before becoming a politician. The umbrella is labelled conscription. What do you think this means? Billy Hughes’s hand is raised. What do you think this symbolises? The arms coming through the window represent Labor Party voters. One hand is holding a piece of paper. What is the other hand holding? On the paper is a question for Billy Hughes ‘Will you resign, or …………’, what do you think goes in the blank? Claude Marquet drew this cartoon in 1916. 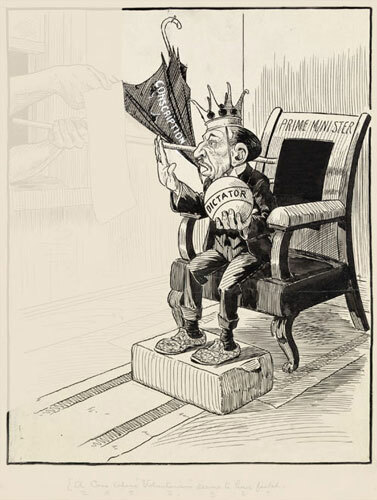 The cartoon refers to Billy Hughes’s political past. Billy Hughes was first elected to Federal Parliament in 1901 as a prominent Labor Party member after ten years as a Labor Mp in NSW. He became Prime Minister in October 1915, during the First World War. 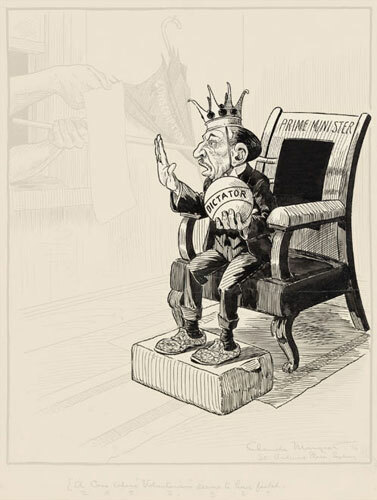 Billy Hughes implemented many proposals that were unpopular with Labor Party supporters including the War Precautions Act and Conscription. The War Precautions Act gave Federal Parliament greater jurisdiction for the duration of the war. Regulations could be drawn up by the relevant minister and signed by the Governor-General without passing through Federal Parliament. This Act was used by Hughes to control people’s lives in new ways. For example, leading up to the referenda on conscription, a regulation that banned statements likely to prejudice recruiting was used to hamper the anti-conscription campaign. 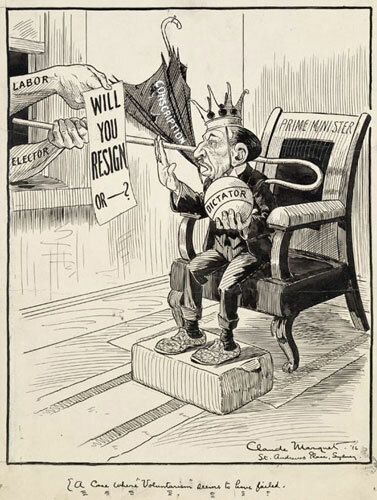 In the cartoon the ‘Labor Electorate’ asks ‘Will you resign, or …………? Hughes’s attitude to conscription caused a huge split in the Labor Party. In November 1916 he and 24 other members walked out of a Labor Party. The remaining 43 passed a motion of no confidence in his leadership. This meant the majority no longer supported him as the leader of their party. The caption is ‘A case where volunteerism seems to have failed’. How does this relate to Billy Hughes and conscription?